I've been blogging for a few years now, and I think I have it down to a fine art. I set aside dedicated time to blog, and have a running list of ideas for blog posts. I bookmark articles of interest, take notes of interesting news items and try to write at least one post a day. That's the theory anyway. Of course, I fail miserably and end up with several posts in draft that will never see the light of day. The fact is that I get periods of time when I have no motivation to write anything, or I have so many ideas I don't know where to start. 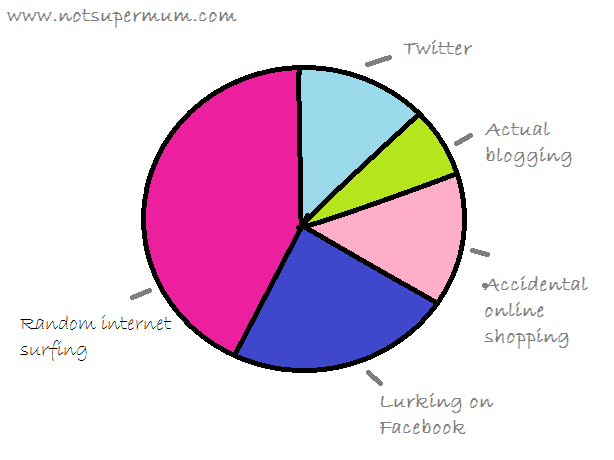 But generally, this is what a breakdown of my blogging activity at the moment. Yep, I think that pretty much sums it up. It's not just me is it?